Over time deposits form on intake valves, in the combustion chambers, and in the fuel injectors. This causes loss of power, rough running, misfiring, pinging, hard starting. Resulting in poor gas mileage. On new Mercedes older than year 1996, deposits will cause all the above which triggers the engines control unit to ‘adapt’ for these conditions. It will add more fuel to the engine's mixture, reduce the engines ignition timing and increase the engines idle. The engine feels like it is running the same because of the control units intervention but the final result is the same, poor fuel economy. The largest cause of these deposits is the quality of gasoline available. It is from the additives in the fuel which cause the deposits. That's why for Mercedes Benz cars we always recommend using the highest grade of gas. In fact it is such a problem that some car manufacturers have released TSB”S (technical service bulletins) addressing this problem. 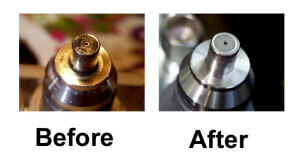 We perform fuel injection service which includes using BG products. First we will scan your cars engine computer, check and note the fuel adaptations. Then we will fog your intake system with BG Fuel Injection System Cleaner which will pre-soak and loosen the deposits, add BG44K to the fuel tank which will continue the job of removing the deposits and at the same time clean any deposits in the fuel injectors. Clean and Dirty Intake ValvesWe will test drive your car to clear out the loosened deposits and than rescan the cars engine computer, clear any codes that were generated during the cleaning procedure and re-check and note the difference in the adaptions.In extreme cases we will also use (at an additional cost) BG Induction System Cleaner directly through the fuel injection system to clean heavily deposited engines. The result after cleaning will be restored power, reduced emissions, faster starts, better engine idling and reduced fuel mileage. Please note not all engines will need or benefit from a fuel injection service. Our technicians can look over your car and inform you what is needed. Call us or make an appointment here for this service or any services or questions we can help you with.We can perform this service on your BMW, Mercedes Benz, Volkswagen, Audi, and MINI Cooper.